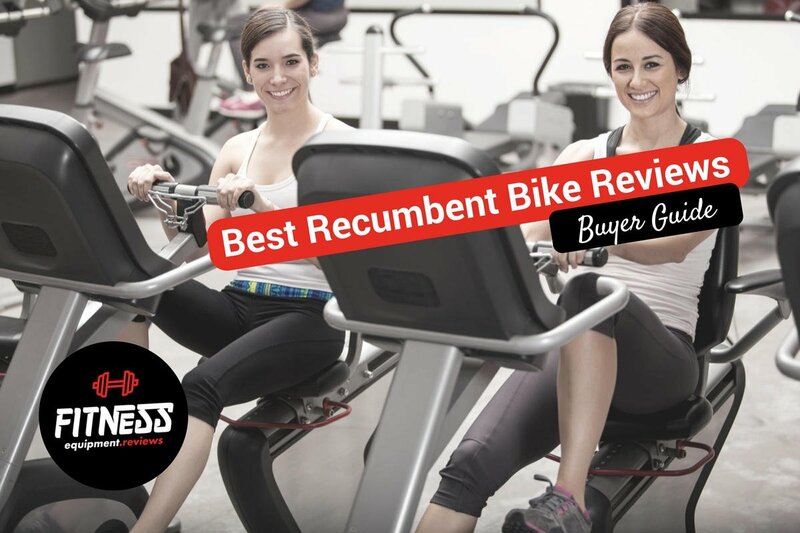 Top 15 Best Recumbent Bike Reviewed 2019 - Buyers Guide Included! Recumbent bikes are some of the main equipment you would find in a gym. These bikes have gained popularity over time owing to the ease of use and the high effectiveness in specific exercises. While they are mostly found in established gyms, recumbent bikes could also work for home use. This type of equipment is motivating, and the best part is that it targets whole body during workouts. The best recumbent bike would have to feature the essential elements that make it worth the purchase. Getting one for your home gym is an excellent way to kick-start your fitness journey without a limitation of when you work out. But first, you have to take on the search to find what works for you, your space and your budget. Below are reviews of some of the best available in the market; hopefully, it gets easier to narrow down and find your favorite model. One thing all exercise bikes have in common is that they give the user an effective cardiovascular workout. The key differences between exercise bikes lies in the set up and style of the machine. 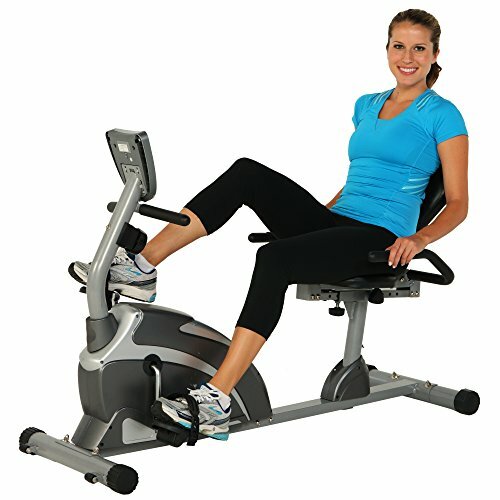 A recumbent bike is designed for comfort so it has a fully cushioned seat and back rest making it very pleasant to use. If you suffer from upper body pain such as back pain then a recumbent bike can be an excellent choice as the user becomes posture aware. 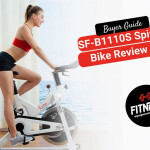 We have also completed a comprehensive post about spin bike reviews here. The Exerpeutic 900XL Extended Capacity Recumbent Bike is our top selection in terms of value for money. It is a best seller and for many good reasons! 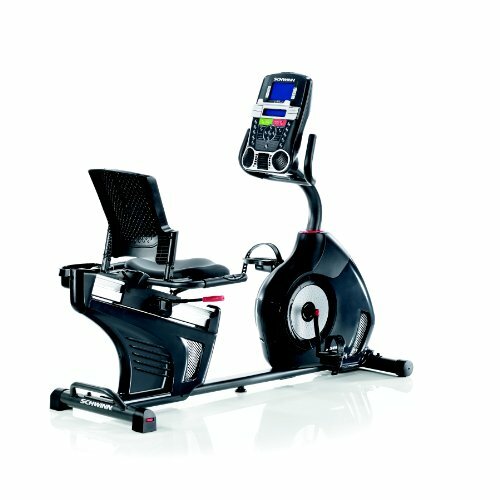 The LCD display of the Exerpeutic 900XL Extended Capacity Recumbent Bike is large making it easy to see your data while exercising. The display shows distance, calories burned, time, speed and heart rate information. Heart rate information is read via the pulse sensors on the handle bars. The recumbent bike itself has a footprint of 54″ L x 22″ W x 34″ H and weighs a total of 63 Pounds. It also has transport wheels to make it easy to move around if you don’t have a dedicated workout space. The included equipment mat measures 79″ L x 35.4″W x .24″H and works to stabilise the recumbent bike as well as protect the floor and reduce noise levels while in use. There is also the option to purchase the recumbent bike without the mat. The Exerpeutic 900XL Extended Capacity Recumbent Bike won’t break the bank and is a a great recumbent bike. It has a large monitor displaying key information as well as pulse sensors on the handles to show your heart rate. The Marcy Recumbent Exercise Bike with Resistance ME-709 has been designed to be compact yet still boast the features of larger recumbent bikes. The Marcy Recumbent Exercise Bike with Resistance ME-709 has been constructed using 14 gauge steel tubing to ensure stability and durability. In addition to the strong build it also features 8 levels of magnetic tension based resistance to test yourself. The LCD computer displays time, speed, distance and calories burned. The assembled dimensions of this bike are 55.5 x 25 x 37.5 inches and it also has wheels making it easy to move and store. With an ergonomically designed seat and contoured handles you will have perfect body form each time allowing you to get the most out of your equipment. The seat is padded with high-density foam with extra support for the back and arms. Counter balanced pedals make it easy to control and feel supported while in use. There are also foot straps which can be easily adjusted to fit your feet. Overall the Marcy Recumbent Exercise Bike with Resistance ME-709 is still a good recumbent bike option. There have been a few complaints about the resistance dial getting jammed. When taking into consideration the price, this recumbent bike cannot be overlooked. The Exerpeutic 1000 High Capacity Magnetic Recumbent Bike W/ Pulse Wider Seat Extended is the next model up from our first product. Is it worth the extra money? Many happy customers think so! The Exerpeutic 1000 High Capacity Magnetic Recumbent Bike W/ Pulse Wider Seat Extended measures 54″ x 22″ x 34″,has a total weight of 63pounds and a maximum user weight capacity of 300lbs. Relatively easy to install with a step by step guide you are looking at about 1-2hours to assemble it. The recumbent bike has been designed with user comfort in mind. The LCD computer displays distance, calories burned, time, speed and heart rate measured through pulse sensors on the handles. Using this machine is smooth, quiet and stable which is what one needs to consider for recumbent bikes under $200. 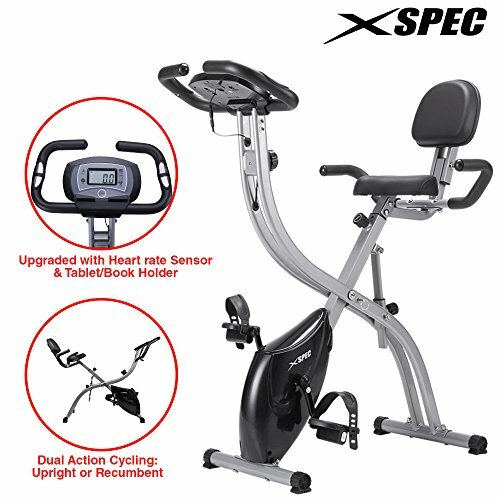 The Exerpeutic 1000 High Capacity Magnetic Recumbent Bike W/ Pulse Wider Seat Extended comes with a 90 day parts warranty which is a little short in our opinion but has a 3 year warranty on the frame. It is an updated version of the first model built for more comfort. The Nautilus R616 Recumbent Bike is one of the better recumbent bikes on the market as reflected by the price. If your budget allows then this bike won’t disappoint! 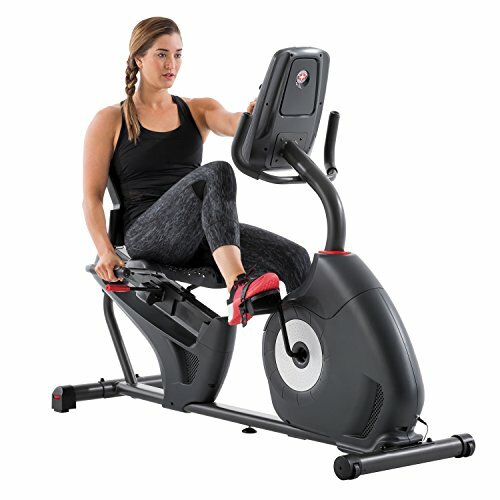 The Nautilus R616 Recumbent Bike is packed with my new and unique features that make this bike worth the money. 25 levels of resistance means you can challenge yourself continually as your fitness progresses. You can also sync the data from your workouts with the MyFitnessPal app to help manage and track your data. 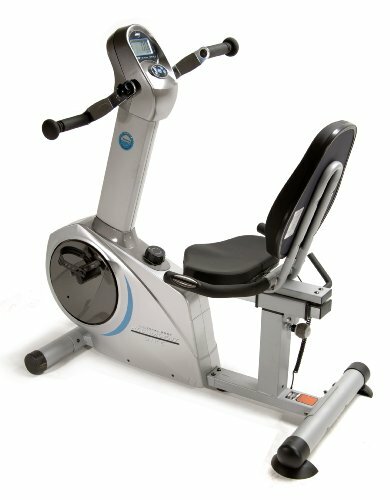 Featuring a vented seat back this as well as a padded contoured bottom this recumbent bike is smooth and very comfortable to use. In addition the Nautilus R616 features an aluminum sliding seat rail system making it exceptionally easy to adjust and lock into place. This bike also includes acoustic chambered speakers as well as a 3 speed fan. 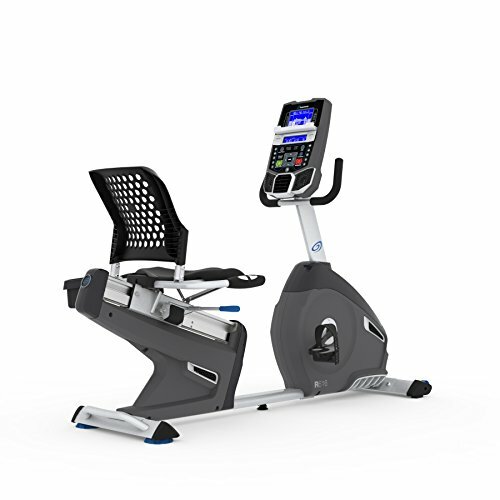 Included with your purchase of a Nautilus R616 Recumbent Bike is a 10 year frame warranty, 2 year mechanical warranty, 1 year electrical warranty and 90 day labor warranty for ultimate buyer peace of mind. The Nautilus R616 has many impressive features that make it very appealing. 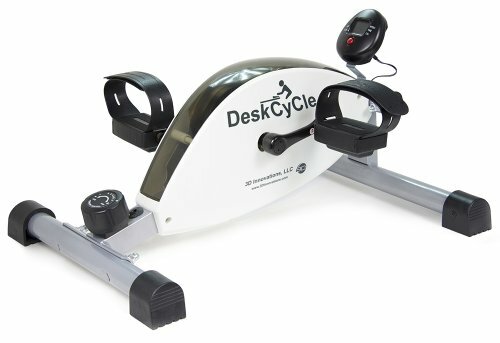 The DeskCycle Desk Exercise Bike Pedal Exerciser is not a complete recumbent bike but an incredibly popular option. This is just the pedal portion of a recumbent bike that can be positioned under your desk or used anywhere around the home. LCD displays speed, time, distance, calories and scan. 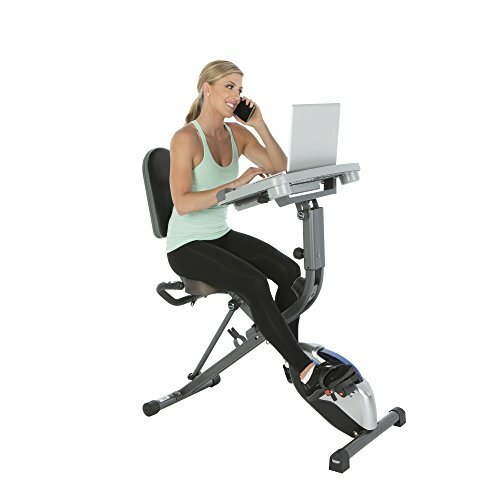 The DeskCycle Desk Exercise Bike Pedal Exerciser can easily work with desks as low as 27 inches and is quiet enough to go unnoticed. If you plan to use the DeskCycle at work it is recommended to keep the resistance at level 3 and below. Studies found this level increases your energy and oxygen to the brain without distracting you. 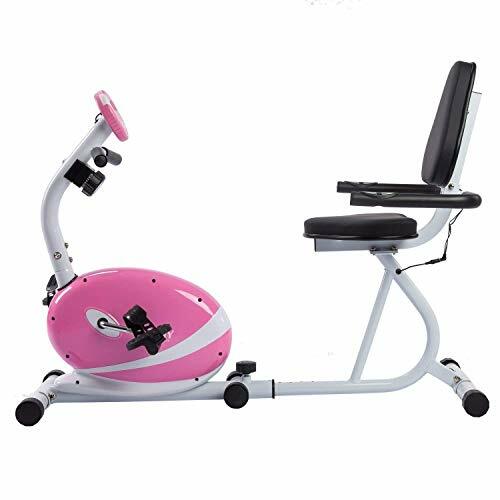 If you are chasing something small that you can essentially use with your most comfortable chair then the DeskCycle Desk Exercise Bike Pedal Exerciser is a good option. This bike is lacking many key features that one gets in a complete recumbent bike set up but a good idea if you have a sedentary job. The Schwinn 270 Recumbent Bike is a mid priced recumbent bike packed with many features. In this price range it is hard to find a better recumbent bike than the Schwinn 270 Recumbent Bike. Packed with many great features and glowing customer reviews this bike is popular for good reason. Head over to our comprehensive review of the Schwinn 270 Recumbent Bike. UPGRADED FEATURES - The new Harvil exercise bike now displays the distance in miles and it also has stronger straps. This X bike comes in Aqua and Peach colors. Dimensions: 26.4 L x 20 W x 46 H inches/ Weight: 44 pounds/ Maximum User Weight: 330 pounds. COMPACT DESIGN, DIGITAL MONITOR, HEART RATE SENSOR AND QUIET FLYWHEEL: The digital monitor displays speed, distance, time, calories burned and heart rate. This foldable bike is equipped with heart rate sensor with a smooth and quiet flywheel. 10-LEVEL MAGNETIC RESISTANCE, ADJUSTABLE SEAT WITH BACKREST AND ANTI-SLIP PEDALS: Adjust resistance and seating position to achieve the desired routine. Minimum user height: 3 ft 10in. Children must have adult supervision when using the stationary bike. DAZADI GUARANTEE: Items ship to your door without defect or shipping damages or we will replace it. We repair and replace defective parts. If you still aren't satisfied, you will get a full refund. One of the crucial factors to keep in mind when setting up a home gym is the size of the equipment you intend to get. This Harvil exercise bike has a compact design to ensure it fits most workout spaces. This recumbent bike has advanced features which include a digital monitor. It displays the distance in miles and consists of a heart rate sensor. Also, the display shows speed, time, distance covered and calories burned. Its compact design makes it a suitable option for a home gym. Additionally, it folds up easily to allow easy storage and save on space. After use, the bike can be stowed for storage; thanks to the two built-in wheels. The bike comes with 10-level magnetic resistance for an even better workout. It has an adjustable seat and backrest which ensure you are comfortable while cycling. It accommodates a minimum user height of 3’10” and so can be useful for kids, of course with close supervision. It is quiet during operation, and this feature makes it suitable for use in any room of the house. This bike’s quality beats most others in the market. Some of the features that quality must be top-notch are the pedals and straps. This particular one has sturdy straps to withstand the repeated pressure. The pedals are durable and fitted with anti-slip pads to ensure you cycle safely. The seat side hands are well-padded to provide the much-needed comfort while racing on the bike. 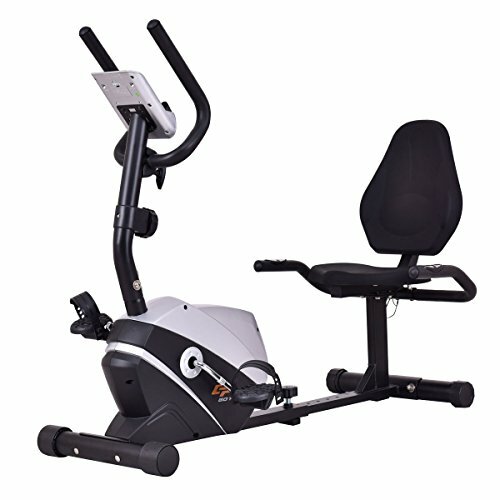 The Harvil exercise bike is recommended for its quality construction and ease of use. With the display, one can monitor speed, time and distance. It suits any space; thanks to the foldable design and front wheels. A fitness machine that helps you track your progress is worth every coin you spend on it. 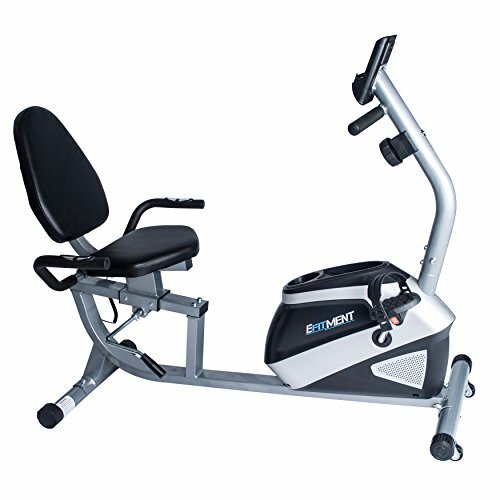 This recumbent bike from EFITMENT is a suitable choice to monitor the essential parameters during your workout. This recumbent bike comes with a handy digital display. It tracks the time, speed, distance, odometer, calories burned and pulse. On the control tab, there is a convenient tablet or phone holder where you can keep your device while working out. The step-through design makes it easy to sit down on the bike and start exercise. An essential feature of this bike is the adjustability on the pedals. You can get the right fit on the pedals when cycling to ensure you are safe and comfortable. As much as this is not a folding bike, it can still be used for home workouts. It does not take a lot of floor space and comes with transportation wheels to store it away conveniently. Therefore, you can quickly move it from room to room as needed. This recumbent bike allows you to increase your resistance up to eight levels. This feature poses a challenge to you to work out even harder for desired results. The magnetic tension system ensures you have a smooth silent ride and takes off the burden to maintain the bike in good condition. With the large backrest and seat, you can comfortably sit and work out for long hours without feeling a strain on your back. This recumbent bike is ideal for home use. With the adjustable pedals and the big padded seat, it gets comfortable working out regardless of the body size. If you are looking for recumbent exercise bike reviews, you might want to stick around for this one. The Xspec couples up as an upright bike as well as a recumbent bicycle for maximum use. This bike gives you the opportunity to enjoy more than one exercise with one tool. The design of this bike allows recumbent and upright positions which provide you with more ways to exercise. This feature makes it suitable to work out different areas of the body with a guarantee of efficiency in any of the two positions. The bike has a built-in heart rate sensor that records your pulse and shows in the display provided. The large display screen is clear to read and comes with an adjacent tablet holder. The holder comes in handy when you want to listen to music from your tab or phone while working out. The bike guarantees seating comfort with the large size seat which is well padded. It is designed to suit different sizes of people and is adjustable for a comfortable height. It offers 8-levels of resistance which gives you an excellent challenge to push more and work out those leg muscles. The tension control system allows you to adjust the level for a more relaxed workout and take it higher for a difficult one. The bike is sturdy and can be folded for storage. That makes it suitable for tight spaces. This recumbent/ upright bike is a suitable choice for home workouts. It has high-quality adjustability features o suit different sizes of people and folds up easily for storage. Although the design of the bike greatly determines functionality, the flexibility plays an essential role in improving the performance. The Goplus bike is versatile and allows adjustments to suit different needs during a workout. The bike comes with an 8-level resistance feature to help you get more out of your work out. It means that you can adjust lower for a smooth ride or take it higher for more resistance. With that, you can be sure of the right intensity to train your muscles and get closer to your fitness goals. Adjustable straps on the pedals make it easy to get the right fit and comfort when cycling. Also, it features thick cushioning on the seat and backrest for extra comfort. The set is large and can be useful to different people regardless of body size. The magnetic system ensures there is less abrasion for a seamless workout. Some of the features of the most popular recumbent bicycle are an easy entry which is the same case with this one. This one utilizes a step-through design which makes it easy for you to go on and off the bike. It is equipped with a hand pulse sensor to record as you work out. The large display shows the speed, pulse, time and calories burned. The Goplus recumbent bike is a suitable idea for everyone with the big seat provision and the adjustability feature of the big seat. A multifunctional recumbent bike is an ideal choice if you want to exercise and get more out of it. This bike from Exerpeutic is and comes with all the features of a fully-functional recumbent bike. This is the most popular recumbent bicycle with its additional features. It comes with a sliding desktop which is fully adjustable to tilt to your liking. Also, it adjusts forward, back, up and down for an even better view as you work out. Other additional features include three angle adjustments, an armrest, a storage drawer, and an LCD computer. This design makes it ideal for home use. The bike has a 2.5″ thick airsoft seat with extra comfort and the seat adjusts to fit a height range of 5’2″ to 6’3″ therefore suitable for use by different people. The structure is sturdy and is built to hold a maximum weight of 300lbs. The semi-recumbent design makes it a proper bike for effective home workouts. This bike has an 8-level magnetic resistance to help you craft different levels for active workouts. You can adjust the tension level to structure an easy or strenuous exercise depending on your fitness goal. After use, you can fold up the bike for easier storage. You do not need to disassemble any parts for storage and therefore convenient for home use. 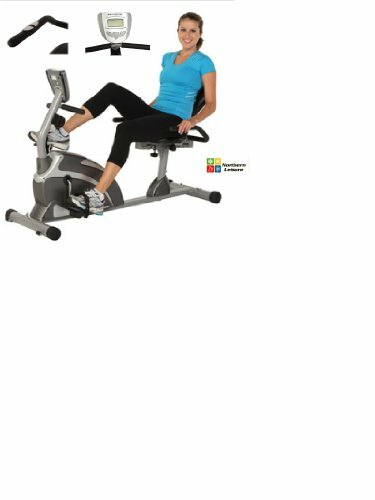 The Exerpeutic Recumbent bike is recommended for its additional desktop feature.t is easy to use and adds on to the comfort while working out. A recumbent bike that gives you a variety of resistance levels is ideal for multiple exercises as well as different intensities. 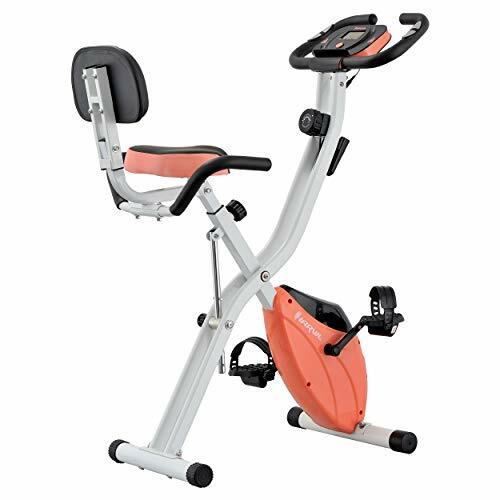 This one from Schwinn is the perfect one; thanks to its wide range of resistance levels. This bike is designed to help you set your fitness goals and track the progress. It has a dual track LCD screen that displays the programs and other parameters such as time, speed and pulse. The bike comes with 20 preset workout programs that make it a suitable choice for beginners. These include nine profile programs, eight heart control programs, and one quick start. The bike has 20 levels of resistance which provide a wide variety of workout options. The range of the levels makes it easier for you to advance to a slightly difficult level with time and learn to build your way up towards a high resistance workout. This feature makes the bike suitable for long-term use and can suit different people’s needs. More to this, the bike has a high-speed drive system for a smooth start-up and quiet workouts. This design makes it appropriate for use in any room. More to this, it has a seat slider system that is easy to adjust to custom the right fit for everyone. It comes with a charging USB port to keep your devices connected as you work out. 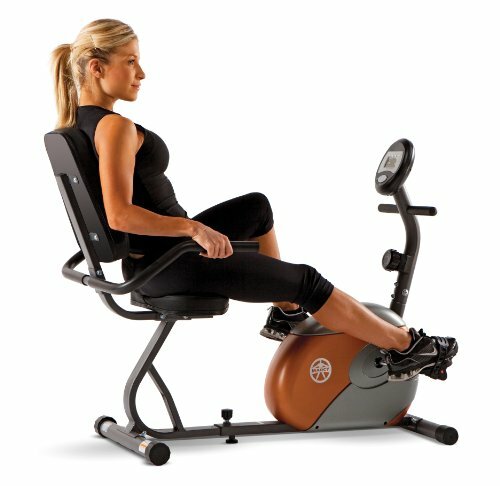 The Schwinn recumbent bike is a suitable idea for a beginner that is setting up a home gym. With the preset programs and the tracking software, one can start their journey to reach their fitness goals. Comfortable, padded, adjustable seat. To maximize the effectiveness of your ride, work within your target heart rate zone: 70% to 85% of your maximum heart rate. As much as the operating system of the bike is the critical component, it is essential to consider the state of the backrest and seat. The Stamina Elite recumbent bike is designed to deliver comfort while you ride to ensure you get the most out of your exercise session. This bike comes with eight levels of resistance so you can get the fat-burning experience you desire. The system ensures you work out silently any time of the day. With the fitness monitor, you can track your progress and monitor the speed, time, distance, calories, and heart rate. The bike is fitted with pulse sensors which come in handy to ensure you stay within your target heart rate zone. The bike is incredibly comfortable to use. It has upper hand pedals so you can exercise the hands too for an effective workout. Also, it has a well-padded back and seat to keep you comfortable as you pedal. This feature ensures you can work out for long hours without feeling the strain on your lower back. Also, with the adjustable seat, you can get the right posture and height for comfort. This bike has textured pedals with straps so you can ride as hard as you want at any speed. The adjustable straps ensure your feet are secure even on high speed. The bike has built-in wheels so you can stow it away after your workout. The structure is sturdy to guarantee durability with regular use. This recumbent bike suits a home gym with adequate space to workout. Although it does not fold, it is highly recommended for its effectiveness and the additional upper hand pedals for more exercises. The distance from the pedals to the base of the seat is crucial and determines how comfortable you are when riding. The Sunny Health & Fitness bike gives you the option to custom-fit the distance, so you are comfortable even for long workouts. One of the elements to look for when choosing an ideal recumbent bike is the system effectiveness. You should ensure that the machine runs on a silent mode so you can use it anywhere and anytime. This bike from Sunny Health and Fitness has a quiet operation and gives you a smooth experience riding even on high speeds. The bike has heart rate sensors on the handles, so you record that as you race up. The recording is then displayed on the LCD monitor. The display also shows other parameters such as the speed, distance, time, calories burned and scan. This information helps you to track your progress and point out how much more you need to pedal to reach your exercise goal. The recumbent bike has fully adjustable pedal straps. These help you to secure your feet as you ride and ensure you are safe when you ride on high speeds. Also, the bike allows you to control the distance between the seat and the pedals to make sure you are comfortable throughout your workout. This recumbent bike is an ideal choice for small workout space. It is fully functional and works well with starters as well as seasoned people. The sliding desk feature is becoming part of the most popular recumbent bicycle designs available. 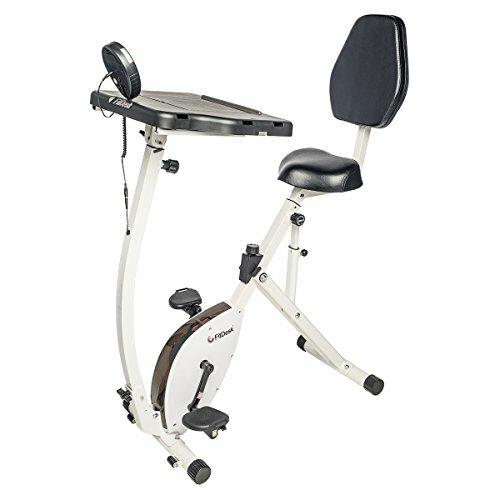 This one from FitDesk is a great example and acts as a fully functional exercise bike for both gym and home use. The bike is designed to last a long time with regular use. It comes with a powder coated steel frame structure which ensures it withstands rough usage. 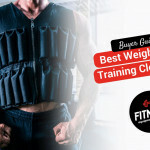 This ensures it can hold weights up to 250lbs, therefore, suiting most people. The bike operates quietly and has a nyloc pedal nut that prevents pedal and cranks arm service. One of the oustanding features of this bike is the sliding desk. It has a grip-top surface and comes with a built-in tablet holder. You can keep your phone in the holder as you work out and listen to your favorite music for motivation. The desk also has easy access storage that includes a tray, a mouse pad, and a cup holder. Setting up the bike to full function does not take time. The bike comes with all the required tools to put it together, and in approximately 30 minutes, you can have your bike up and running. It folds and locks easily for easy transportation and convenient storage. With the 3-D interactive app, you can have an even easier time assembling the bike. This bike is recommended for taller people. It has a useful sliding desk and is pretty easy to use. The assembly is easier compared to other bikes, and there is a helpful app for quick assembly. A recumbent bike is helpful for cardiovascular exercise. This is one of the major benefits of using one on a regular basis. The bike allows you to engage some of your major muscles in the body including the hamstrings, and quadriceps. The rapid exercise created on these muscles help to race up the heart and improves cardiovascular health. People that ride on a recumbent bike regularly tend to have healthy lung and heart function. They have better circulation and improve the respiratory system function. In turn, this lowers the blood pressure and helps to keep lung disorders at bay. As mentioned, a recumbent bike engages many muscles at a go. When you are in the inclined position, you exert a little weight on the target muscles building strength over time. Unlike using an upright bike, riding on a recumbent one helps to stretch out stiff muscles and tone them with time. When you lean on the backrest and position correctly on the seat, you feel less of a strain on the muscles that you would feel if on an upright position. A recumbent bike has a large seating area and takes the pressure off your lower back when exercising. You feel more comfortable and stable to work out even more and take on different intensity levels. The position you take on a recumbent bike tends to be more natural, and it almost feels like you are doing so less while cycling. The back muscles do not feel the strain, and you have a more natural stretch of your legs when you pedal. The incline position does not allow you to stand on the pedals like you would if using an upright bike. It is clear that the more comfortable you get, the more exercise you are likely to do. Many people mistake the comfort of the recumbent bike to be ineffective during a high-intensity workout. But, with the position, you are likely to engage more muscles including those of the lower abdomen for better results. Also, since you are stable and comfortable, you can work out longer on the recumbent bike. You are likely to return to the bike more often because you hardly feel the muscle strain which is a lead demotivating factor. With more exercise, then you enjoy the improvement in your overall physical health. Before you can consider the aesthetics of a recumbent bike, it is essential to check how much weight it can bear. Usually, most bikes have a maximum weight capacity of 200lbs to 300lbs which suits most people’s needs. Ideally, one with a high weight limit works well for many users. The stability of a recumbent bike is determined by the quality of the frame and the overall design. Is it firm to press down? Does it have a stable seat and back? Does it allow adjustability to suit different needs? These are some of the pointers to check for to ascertain the overall stability. This factor is based on the seat and backrest design. Does the seat have quality padding? Is it big enough to accommodate individual sizes? What is the shape of the backrest? The ideal situation is adjustable seat height, well-padded and a sturdy backrest for comfort. Like any other gym equipment, your recumbent bike should be safe to use. Safety for bikes lies on the pedals design and the suitability of the handles. The pedals should be sturdy and preferably have an adjustability feature to custom the right fit. The handles should be non-slip to ensure the right grip on high-intensity workouts. You want a recumbent bike that starts easily takes less time setting up and operates smoothly in silence. You should consider checking the system the bike runs on to ensure it is something you can handle. Also, the settings panel should be easy to navigate, so you have an easy time changing the resistance levels. Without a doubt, any recumbent bike should be easy to assemble. When searching for one, ensure it comes with an instruction manual, tools if needed and a step-by-step guide on how to do it. Unless you have an established gym room, foldable and compact designs are recommended for easier storage. This factor is crucial to ensure you track your progress and custom some workout programs. The display should be of reasonable size to read comfortably. Also, the information processor should be as accurate. The screen should show the time, speed, distance, calories burned, heart rate among other parameters. As time goes by, your recumbent bike might need a bit on maintenance to keep it running. However, this does not mean that you have to change parts or replace it. It is essential to check on the durability of every feature on the bike. That includes the seat, back, pedals, handles, frame, display, etc. Recumbent bikes come in various models and sizes. Your selection is ultimately determined by the level of workout you intend to engage in and your overall fitness goals. Also, you ought to select based on the quality of the bike, the available and the suitability to the users. The right bike should be easy to use and take as less time as possible to put it together. Also, it should have a reasonable weight capacity to suit the different users and allow adjustments for different sizes of people. Most importantly, the right bike should suit your space and work well with the available storage space. Recumbent bikes are a great way to include a high intensity cardio workout without compromising your joints. These are low impact machines but don't let that fool you - these bikes still give a solid workout.